Halloween is a week away and I still need to make my son’s costume. He is going as the Grim Reaper. He has no idea what the Grim Reaper does, but he assures me he will be a “nice” one. I am going to call him the “Grin Reaper” :). The costume is basically a black robe with a hood. We will paint his face to look like a skull and he has a kid’s size scythe he will be carrying (to be honest, the scythe was the selling point of the costume for him). 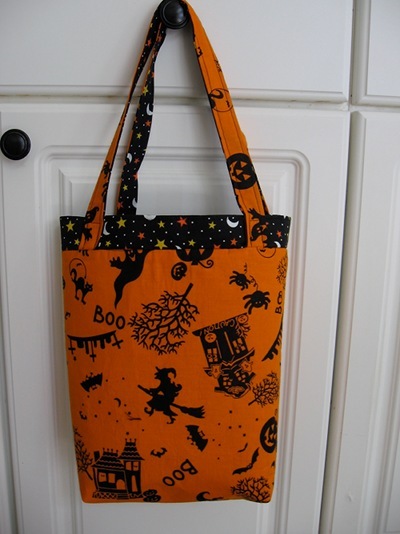 In the sprit of the season I wanted to remind you that I have a free pattern available for a trick or treat bag. It’s pretty simple to make, and it makes a nice tote back if you do it in different colors. You can download the pattern by clicking HERE. This entry was posted in Holidays, Purses and Totes. Bookmark the permalink. How many pounds of candy will this bag hold? Hmm, good question. I would think it holds at least 15 pounds! Will let you know on Oct 31. Love the color/pattern you picked for this project!!! What a cute bag. I finally posted the pictures using your spongebob fabric, thanks again! Thanks Lynn! I saw the pictures of the Spongebob Quilt. Very cute!! What a cute pattern! I’ll have to make one of these for my little grandson. 🙂 Just stopping in by way of Lynn’s blog. Aren’t those Sponge Bob quilts adorable?? Bless you for making the fabric donation. You ladies rock! Thanks for this very nice pattern. I had a lot of fun making it. I ran into a little trouble around the handles….could read make sure handles are entirely tucked inside bag perhaps. Also, WOF for handles might just read 36″ — for beginners but it came out really nice. I’ll see if I can post it or if you want me to, just let me know. Tegan, I’m glad you enjoyed the pattern. I’ll take a look at it and make those corrections you suggested. I would love to see it. Can you email it to me at keepitthimble@gmail.com? I’d love to post it on the blog.